Travel enriches our lives, but it’s the people we meet that makes the difference. It isn’t where we go that makes travel so enriching, it’s the people we meet that bind the places together with the fabric of life, that makes us richer for the opportunity to go beyond our tiny corner of the globe. My recent trip to Seattle wouldn’t have been as enriching without the people encountered along the way. So many of the wonderful people I’ve met in my travels would have remained strangers if I hadn’t found a way to talk to them. Everyone has a story to tell. Luckily I seem to have a knack for finding a way to start a conversation with just about anyone. And I have formed many new friendships because of it. A comment here or there opens up the world, but also makes the world a much smaller place in the process. 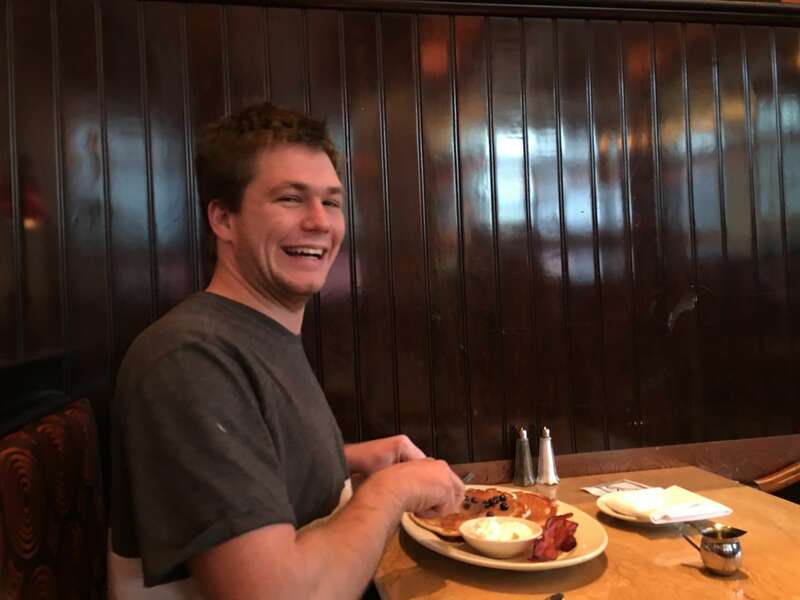 While having breakfast at the Cheesecake Factory, 700 Pike Street, a young man was ushered into the booth next to me. I could hear his conversation with the waitress, and since I’m fascinated by accents, I was tuned into his – slightly English – with a touch of Aussie. When you are a long way from home, an Aussie accent is the golden thread that links you with the homeland you are missing. When he finished his discussion about the menu, I had to ask, “Where are you from?”. As usual, an Aussie’s initial response when travelling is simply, ‘Australia’. It’s a big place, and for most Americans, ‘Australia’ is usually enough. Even those less travelled Americans have a reasonable idea of where Australia is, or at least they’ve heard of it. With a little more probing I discovered that my dining-neighbour was actually from Brisbane. Now that’s a little closer to home, given that I live about 100 kilometres south of there, and it is my nearest major city. Louis’ fascinating story of life in a military family resonated with me – having spent many years ‘married’ to the Australian Defence Force, and the travel involved in a military lifestyle. Louis was on his way to Las Vegas, but needed advice on the best means of getting to the Airport. Feeling more like a Seattle-local than I deserved to, I knew exactly how to get to the Westlake Station and that the Airport Link was probably the easiest, and least expensive way to go. Whether he needed it or not, my travel-buddy and I took Louis under our (collective) wing and walked with him to the station, helped him buy a ticket, and bade him farewell as the train approached. He seemed genuinely appreciative, but I’m sure he would have made it on his own. After all, he seemed like a very capable young Aussie who had followed in his father’s military footsteps. Once Louis was safely on his train to the Airport we made our way back to street level, but as luck would have it, a musician had taken up a key position mid-way. And in true travel-friendly style, we stopped to listen. 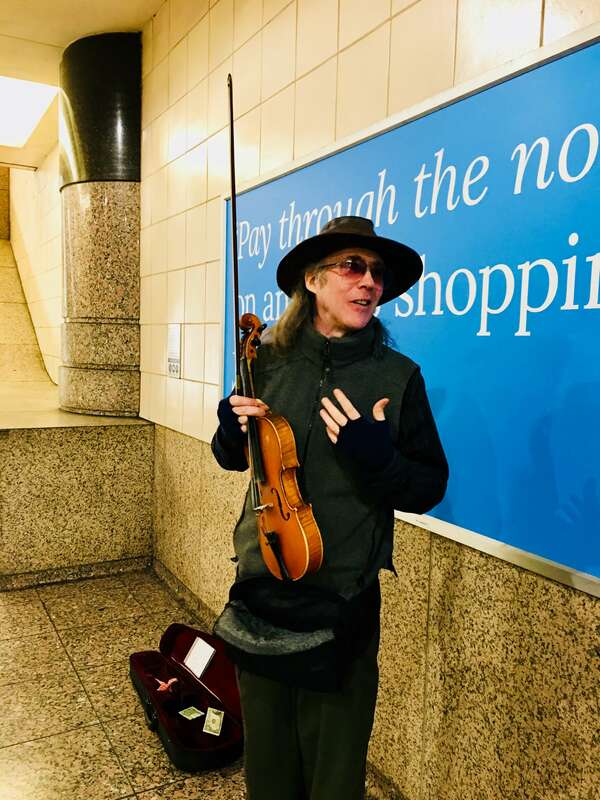 My travel-buddy is a classical music fan and the instrument David was playing was a little unusual – or at least – the way he was playing it seemed unusual. A lengthy conversation ensued, culminating in my travel-buddy being given a CD of David’s unique music. A few extra dollars found their way into David’s instrument case in appreciation, and we continued our journey to higher ground. We had just made another American friend to add to our growing collection of global-friendships. And who could forget Olga! 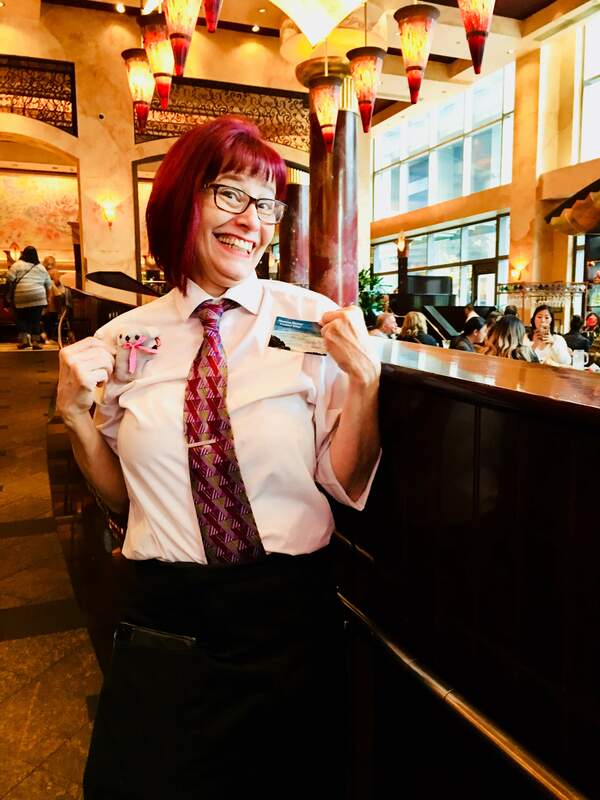 When we stepped into the Cheesecake Factory that morning, Olga was our waitress. 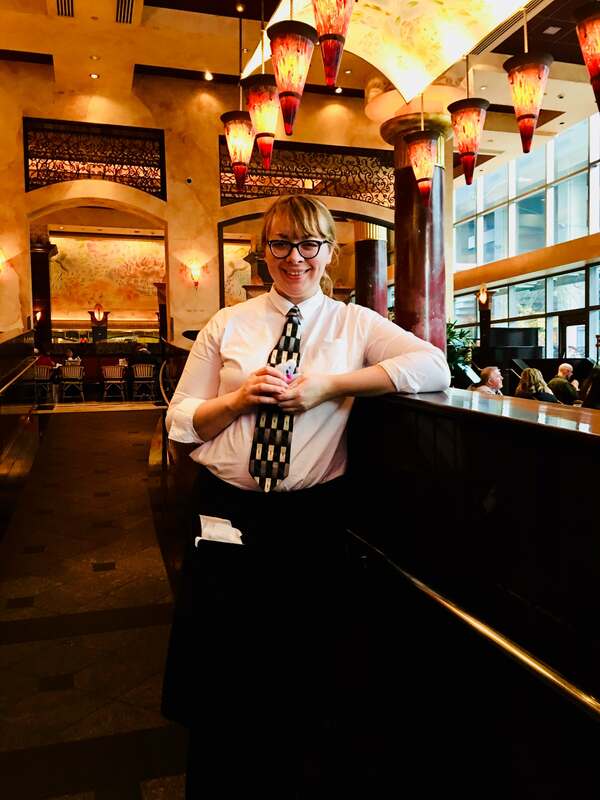 When we left at the end of the meal, we felt like Olga was an integral part of our Seattle eperience. Olga is the kind of waitress who takes an already good meal and turns it into a great dining experience. It’s no wonder the Cheesecake Factory is such a popular place for Seattleites to dine. Great food and even better service from outstanding staff. The reason we decided to have breakfast at the Cheesecake Factory was Lyn. We had ventured in for a late-night snack the night before and were greeted, and taken very good care of, by Lyn. Before we’d even studied the menu that late night, Lyn arrived with a basket of absolutely delicious bread samples. It made the task of exploring the menu so much more enjoyable – there were so many choices. Because we weren’t overly hungry, having eaten much earlier, we apologetically settled on a milkshake. Lyn understood completely and was back in no time with our fantastic shakes. …she beamed happiness! It seemed that making diners feel comfortable was her mission in life. And her mission was accomplished when we promised to come back again. Breakfast at the Cheesecake Factory was sealed for the next day. You can imagine how we felt at seeing Lyn pass by our table the next morning. She remembered us, and stopped to say hello. I may have asked her if she had slept there the night before, but she assured me she had actually made it home for a few hours sleep. That’s What Makes A Great Dining Experience! And just to reinforce what a great place the Cheesecake Factory is, Lyn’s two daughters work there as well. That says a lot about a restaurant. The Cheesecake Factory is high on my list of places to eat in Seattle – in fact – anywhere in the US that is lucky enough to have this great chain as a dining option. I can’t guarantee that other places have staff like Lyn and Olga, but I look forward to hearing from travellers who have experienced the Cheesecake Factory in other cities. Does Seattle have the best staff? I’m hoping to test the theory every chance I get in my future travels across the US of A.
It’s about the people: the Louis’, the Olgas, the Lyns and the Davids of this world, who contribute to the richness of our travel experiences. The buildings and landscapes of foreign places will live on through the photos we take, but the people we meet make a lasting impression because of the way they made us feel. Many will become friends that we stay in touch with. Others will be thought of from time to time, rekindling the same warmth we felt when we met them. From The Heart – I Thank You! To all the beautiful people of Seattle, and especially the ones I’ve mentioned in this and other posts – thank you. It might have been just a kind word or gesture, but it created a lasting memory of a city that cares, especially about travellers with strange Aussie accents, like me.